Tell me about how much flour to use in your recipes. I don’t understand what 400 g means. I’ve just done a quick search for conversions – not sure what kind of measure you want but the BBC has a converter on it’s Website and it’s calculation made 400g = 14 and 1/4oz. Another site (The Metric Kitchen) had cup conversions, and I make 400g 3 and 1/3 cups. I hope this helps! I’ll try to remember to offer alternative measures in future, but have to admit to being a grams girl myself! Hope your baking goes well! thanku for this recipie i enjoyed doing this and paricully enjoyed eating it after and so did y family. Hi just found your blog and it’s very helpful to a new bread maker, but I have been using warm water in all my bread and I noticed you say room temp have I been doing in wrong?? Don’t worry I think you’d know if you were doing it wrong – the bread would not look, smell or taste right! If you like what you’re making, keep using the same basic principles and experiment with different ingredients – not the method! 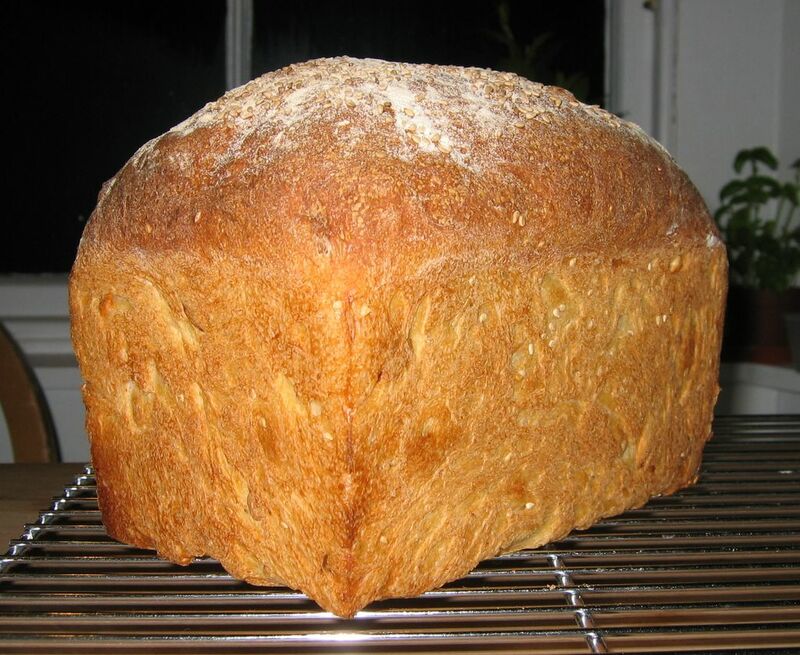 If you are making bread by hand, you will need to use warm water to activate the yeast. The water needs to be warm but not hot – too hot and it will kill the yeast, then your bread will not rise. If you are making bread in a machine, they all seem to work slightly differently in this regard: some may ask for warm water, others don’t. Mine has a long ‘rest’ period before starting any kneading, this brings the water up to room temperature even if it is actually very cold. The machine also begins to heat the ingredients just before kneading. The dried yeast powder has to be placed at the bottom of the mix (under the flour and other ingredients) with the water poured on top – this keeps the water and yeast separated until kneading begins. Other machines I’ve seen put the water at the bottom of the pan, with the other ingredients floated on top…again the yeast placed last to keep this separate until mixing begins. If you use a breadmaker, my advice is to follow the basic instructions in the manual…once you’ve got the general idea of how the machine works then you can start experimenting with the ingredients you use…but you can’t do anything to change the basic process and various stages it is programmed to run. By hand, you have full control and can use a wider range of methods – including the use of live yeast which most bread machines do not use. Remember to keep to the general proportions of flour to yeast and water/other liquids, and use heat with care – for example, when warming water to add to live yeast, or looking for a warm place to proove the dough.